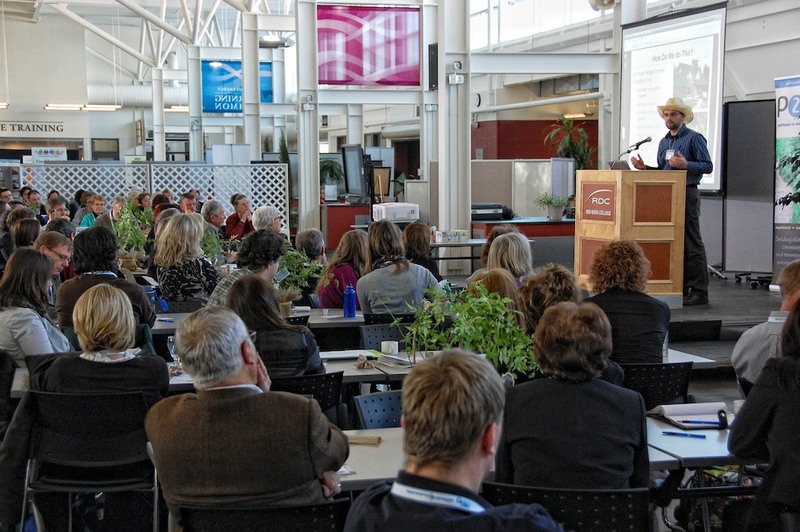 Mechanical Engineer and Permaculture Advocate Rob Avis serves up ideas and inspiration at the Pathways 2 Sustainability conference that just took place in Red Deer. No matter what we're up to, we could always do it a little better. Attending conferences is a great way to connect with individuals in your field, find out about new ideas, and get inspired. Connecting with people: Whatever you're doing there's someone else doing something similar somewhere. They might be able to shed some new light on how you could improve. Conferences are great for this, because the people who show up are already self selected to be interested in what the conference is about. You get to talk to people face-to-face. Even in this age of instant communication with hundreds of friends and followers there's something special, high bandwidth, even primal about face to face communication. Electronic communication can keep a relationship going and share information efficiently, but it takes body language, voice intonation, eye contact and a handshake to really connect with someone. Then use the tech to maintain the relationship. Discovering new ideas: Once you've done something for a while it's easy to fall out of that beginner's mindset where you're constantly learning and finding interesting ways to improve. It's hard to tell if you're in a groove or in a rut. If you're willing to be open to them, conferences can bring the new ideas to you without you having to go and seek them out. Once you know about new ways of doing things you can go try them out. Maybe in small batches, maybe only as a test, but you can find out if they work better for you. Even if most of the time they don't, that chance for a permanent improvement in what's going on could be worth a lot in the long term. Remember, ideas are easy. It's the implementation of them that's tough. Inspiration: Once something becomes routine it's easy to lose sight of why you do it. At conferences there will be lots of information fired at you, sometimes from people or areas that you don't expect. Don't count them out. The more oblique perspectives help position you within the context of the whole, and can remind you that what you're doing is worthwhile. Once you finally do know it all, presenting at a conference can really be worthwhile. It's a form of giving back to those who have helped you all along, and afterwards, the people who have something interesting to add will come up and ask you questions that could provoke an extension of your ideas. Failure had better be an option.